There are no more excuses for not working out. The recent launch of the new PIT Fitness app, available for IPhone or Android is a must-have for anyone trying to get in shape or keep in shape. Developed by fitness expert Trent Bender, the PIT fitness app incorporates the use of a wide variety of different high intensity exercises which will strengthen the body any way you want, and get the personal results you want. This app gives the user the ability to tailor the workout to their own specific needs. One can work lower body, core, or upper body. There are strength building, and endurance building exercises as well as demonstrations which will ensure proper body positioning in order to maximize results. You yourself create your own individualized workout. No more searching for overpriced DVD’s to play. Perhaps best of all, your workout will be readily available on your mobile device, so it goes wherever you go. When you go on vacation, it goes with you. Even in a hotel room, one can get a full body workout. Though there are exercises which involve dumbbells, kettle bells, sandbags, etc… there are many others which allow for just the use of one’s own bodyweight in order to achieve the desired results. The plank pushups and full range squats are particularly effective and do not require any additional equipment. No more need to overspend on a Gym membership which rarely gets used, and is difficult to cancel. Even if you are actively using your Gym membership, why not have your own personal trainer without the added expense of hiring one ? *This app can be used by anyone of any fitness level. *There are about 300 different workouts available which incorporate about 150 different exercises. *The app allows you to create a custom music playlist. *Trent takes you through a video demonstration of each workout, so you know how to perform the exercises the right way – You literally have a personal trainer at your fingertips. *You can set a timer for your session. *Full body workouts achieved in 15-20 mins. *The workout system is intense, effective, efficient and will get you the fast results that you have been wanting. *You can share your results via social media. This will be the best $2.99 you will ever spend. 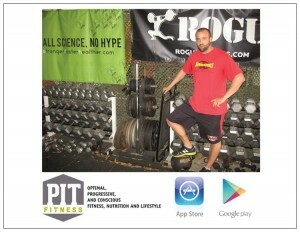 Search ‘PIT fitness’ in the App store of your mobile device and get started right away. Since it’s release, this App has received a “Five Star” rating in all user reviews. ** This is the brainchild of Trent Bender, a Strength and Conditioning Coach, Personal Trainer and Nutrition and Supplement Specialist, based in Venice, CA. Trent is dedicated to improving quality of life, health and well-being by way of proper exercise and diet.